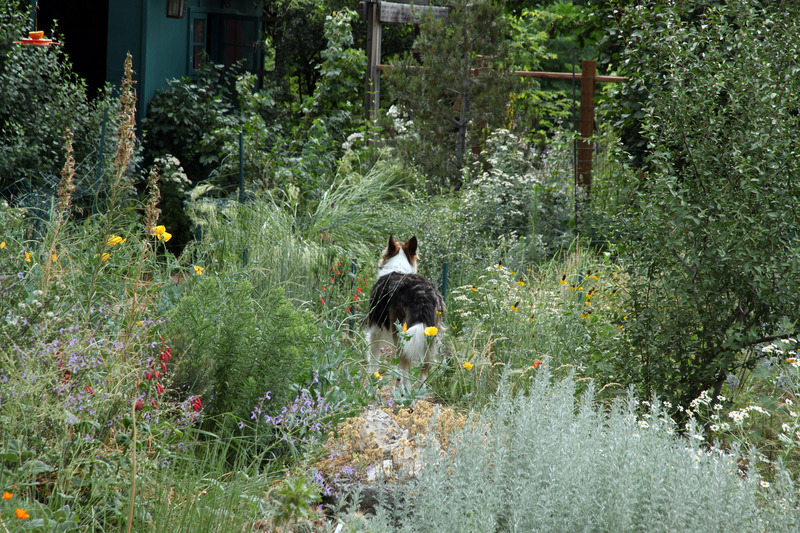 Greetings and salutations, everyone; yes, once again it is I, Mani the smaller-than-huge purebred border collie, filling in for the guy I live with, and here to bring you the latest news from our garden. You may remember me from such posts as “Hazy And Jungly”, among so many, many others. 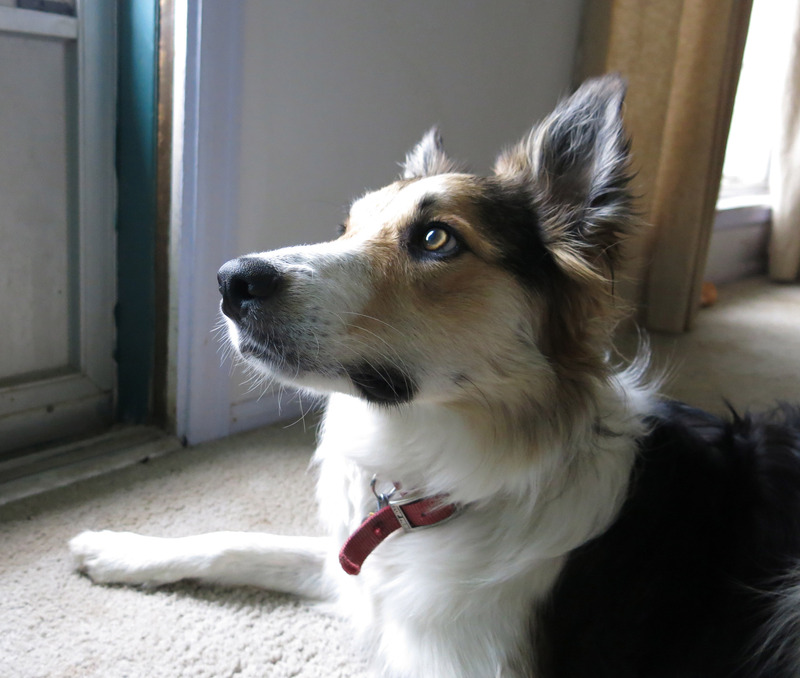 Here I am in a characteristic pose. I’m looking at a bug on the wall outside the front door. I guess you can see why the guy I live with calls me “Licorice Lips” sometimes, because on the left side of my lips there’s an extra black spot, which, he says, makes it look like I’ve been eating a lot of licorice. I don’t eat licorice. The guy I live with loves it, though. Anyway. It’s been sort of raining here, sprinkling a little, then seeming like it’s about to rain a whole lot, but not doing that. The forecast for a couple of days here was for heavy rain, but not much of anything happened. The guy I live with has been weeding, a bit, and he says it’s easier if the garden isn’t soaking wet. 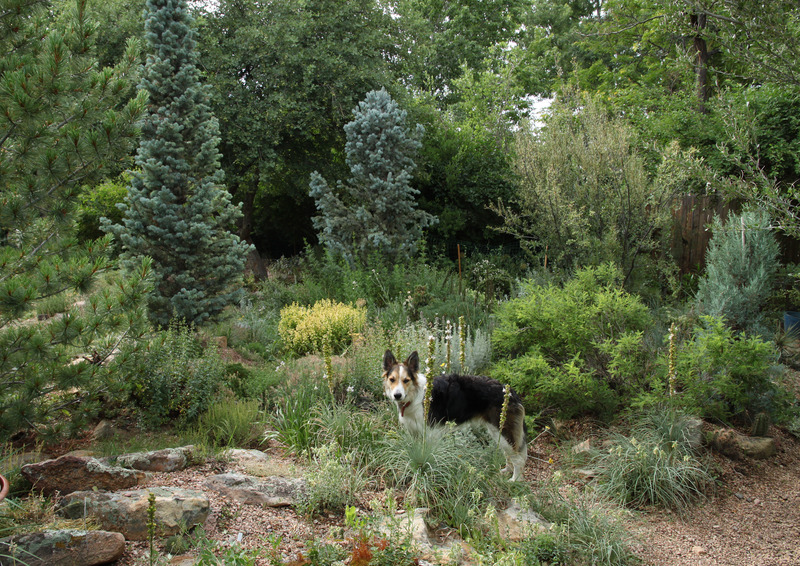 He worked on the old rock garden the other day, and I inspected his work. It was okay. He missed a few weeds. (A few thousand, but I didn’t say that.) 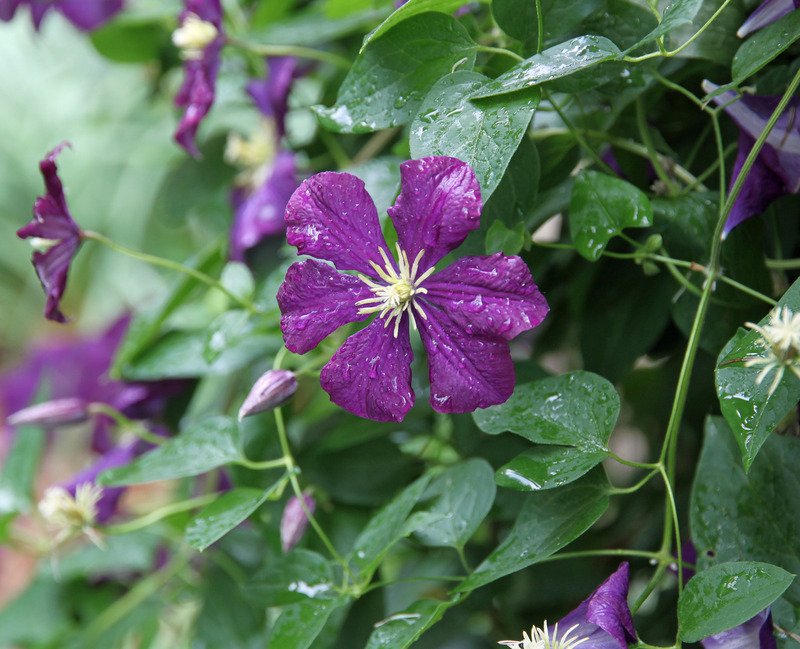 The clematis are blooming. There aren’t many here these days. I guess there used to be, back in the old days. I think this is ‘Etoile Violette’. 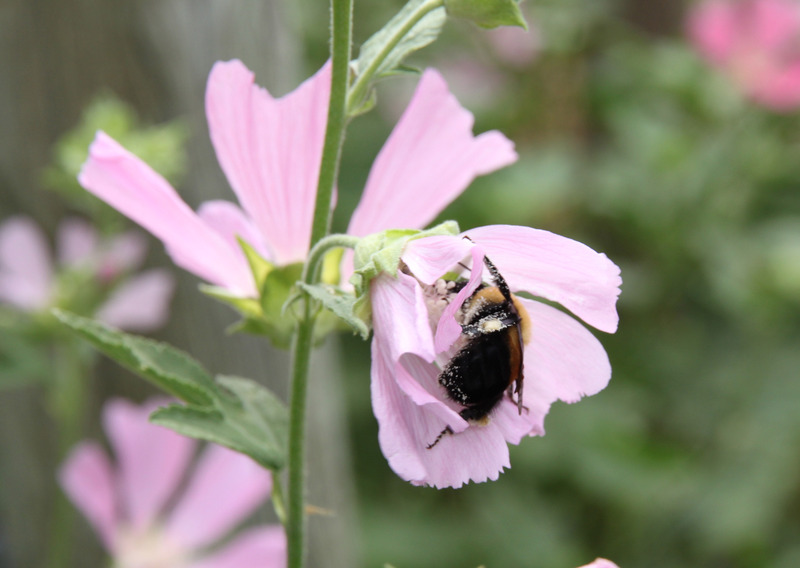 There are bumblebees everywhere, too. The guy I live with keeps telling me not to try to catch them, but I don’t see why not. He says something about stinging, and also says he knows best. 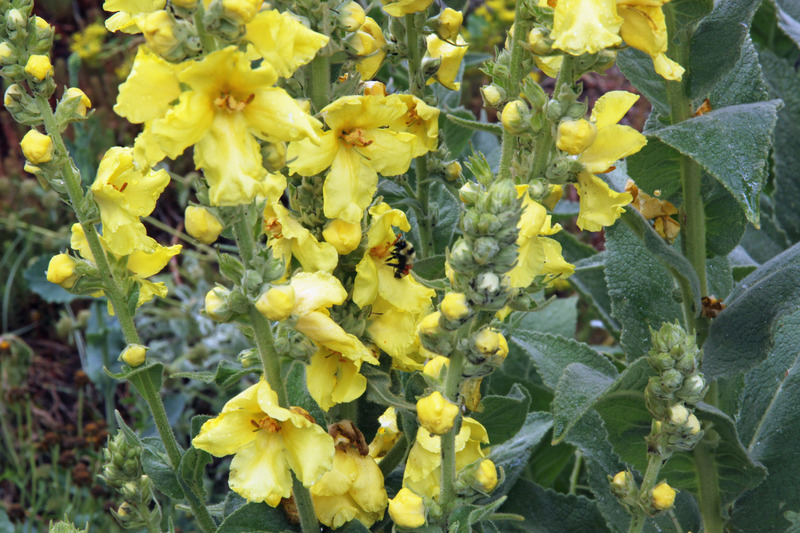 We think this is Verbascum densiflorum crossed with V. olympicum, but we’re not really sure. There was a bee on Eremurus olgae, too, but it was on the other side of the flower stalk here, so you’ll just have to imagine it. You can see the eremurus in this picture, too; off to the left. The garden has gotten a bit jungly, again, for my taste. And there haven’t been as many orioles here this year, which makes the guy I live with sad. There are some, but not a lot. The feeder is that orange thing in front of the shed. 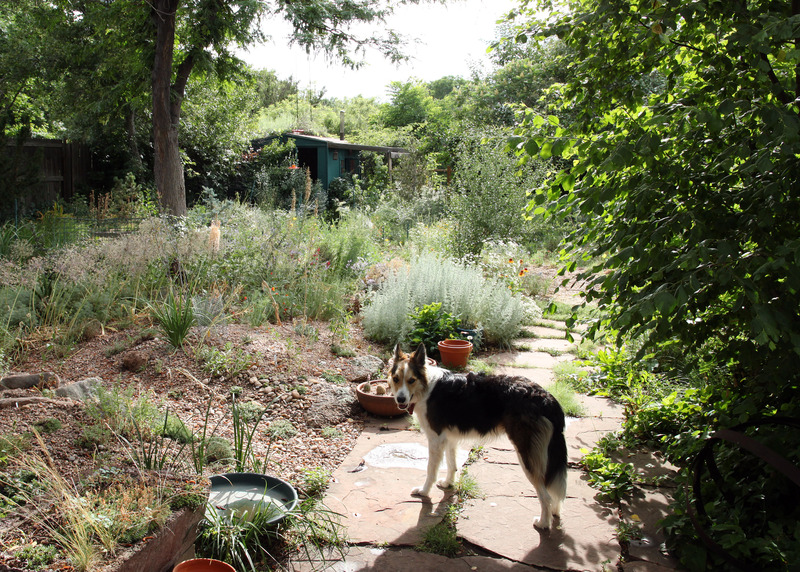 I keep getting reminded that this is a gardening blog, and not an entirely-about-me blog, and so I should show more flowers, but on the other hand this is the time of year when everything really is about me, or it ought to be. There have been firecrackers. They are really scary. Also against the law, but that doesn’t stop some people. I don’t think thunder is very scary, but huge explosions over my back yard are definitely scary. Good thing I have a fort to secure myself in, isn’t it? Back to flowers. 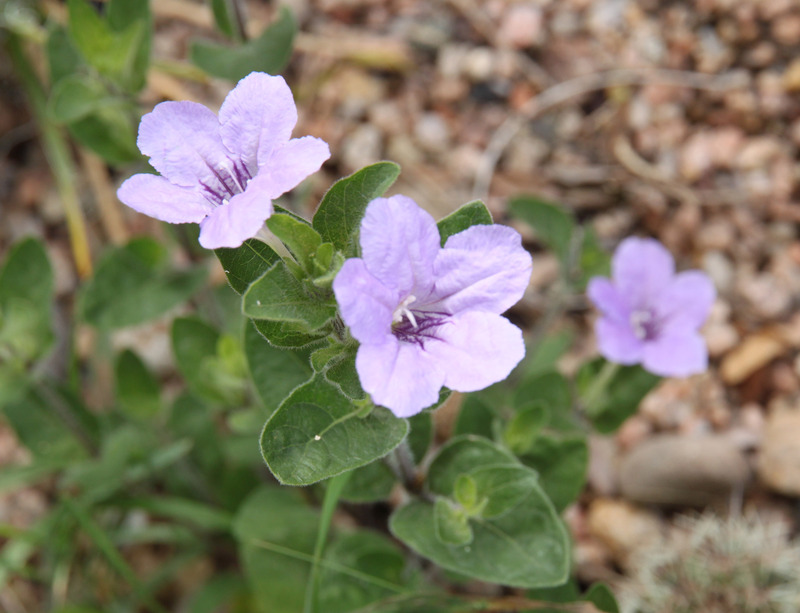 This is the “wild petunia” (but not an actual petunia), Ruellia humilis. The guy I live with says you plant it in one place and soon it appears in another. This is one of those other places. And then the rose, ‘Darlow’s Enigma‘. It flowers pretty much all summer. There are four plants in The Enclosure. This little garden was only half-finished when the lady of the house passed away; it was her little garden space, with a bench to sit on and read, and a fire pit, and the guy I live with fretted about it for a while, and then eventually planted these roses there. The little garden is bathed in scent all summer. In the “way back”, there are a lot of plants of Lavatera thuringiaca flowering now. They sow themselves all over the place, I guess. I suppose it’s time to wind this up now. The weather has been so cool and pleasant, but I hear that it’s going to be roasting hot again in a few days. I’d rather it be cool and pleasant than roasting hot, but the guy I live with says there’s nothing he can do about that. I know this picture makes me look like I have a horned poppy in my mouth, but I don’t, really. I had to turn around to look at something. There’s always something to look at or listen to, around here. Oh. I keep posting pictures with me in them, instead of bringing this post to a close. I can’t really help myself, what with me being so photogenic and all. 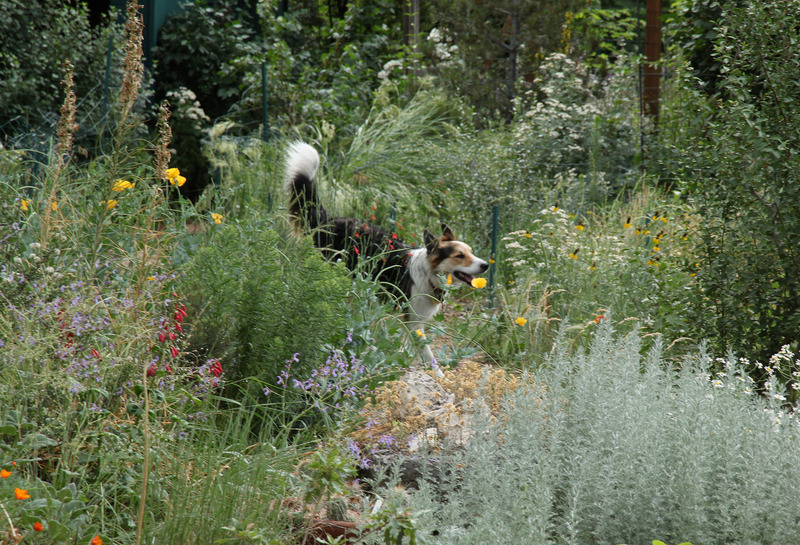 Oh, my, Mani, you have a pretty garden in which to romp. Such pretty flowers too, all fitting together. Of course, I especially like ‘Darlow’s Enigma‘ and appreciate the sentiment behind its planting. So sweet. I hope you understand the concept of “sweet,” Mani, because you are verily a sweet doggie. “Sallie Holmes” would make a fine companion, just saying. I too appreciate jungly, but my husband joins the guy you live with in adhering to the cult of prune. Love the eremurus; I believe it’s a plant we grow here. 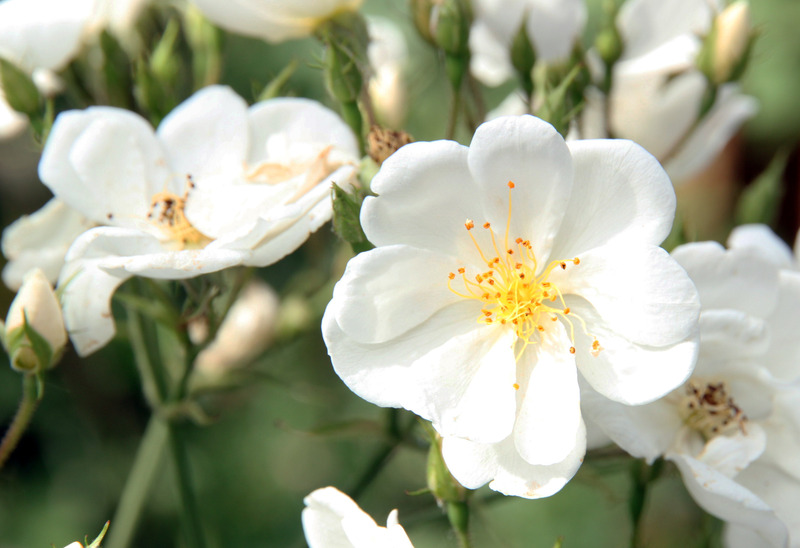 My husband once astonished a crowd gathered around the plant in Chelsea Physic Garden by mentioning we grew one too. Apparently it’s quite rare and pampered in England. Never tried growing clematis, I might one day summon the courage. In closing, sweet dog, I mention I love me my licorice too, but I don’t partake before doctor visits because the herb raises blood pressure. Doctor and I are the happier. And final close, you are a handsome – and quite leggy – doggy. Thanks; I am quite leggy, am I not? The guy I live with says I’ll probably “grow into” my legs eventually, and look “normal”. I could probably accomplish this with a great deal of eating, I think. (I could start tomorrow.) If you remember the post “We-Are-From-France”, that’s where the eremuruses came from. I removed a couple for inspection some time after that. It was fun to see the guy I live with run after me, yelling. They cost fourteen euros each, which I guess is a lot. He says this species is the parent of quite a few of the hybrids you can get here, but that he wanted the actual species. Just because, you know. He’s also had second thoughts about planting more roses. Something to do with him turning sixty-five this month. Clematis are okay, but “they get blister beetles something fierce”, which, if you have blister beetles, is something to think about. The guy I live with says “Panda” when it comes to licorice. Though “Tire Tread” is good, too. Licorice from Finland. The thing about licorice is that people either love it or hate it, and so if there’s someone in the house who hates it, then you can buy lots, and never worry about it being secretly consumed while you’re away. Neglected to mention: Great photographs, really. Verily. Truly. Thanks. I can’t take credit for them. Paws, you understand. I just post. I believe liquorice has major pharmacological properties. At one stage I could not produce enough of the important stress hormone, cortisol. It was suggested that I take licorice tea because it slows down the hormone’s breakdown. Grape fruit apparently is even better. Whatever! I like licorice so it helped. Love the rose and the those horned poppies are such a pop of memories! Indeed, licorice is supposed to have a lot of good properties. Some not so good, like raising blood pressure. The horned poppies are Glaucium flavum, of course, but the orange ones, and the more elusive red ones, are excellent too. Hi Mani, how many flowers now in your gardens! There are, aren’t there? And it’s been very dry here in the last month. I think that settles it. We’ll have to get a Darlow’s Enigma. And more black licorice. It is delicious for sure. 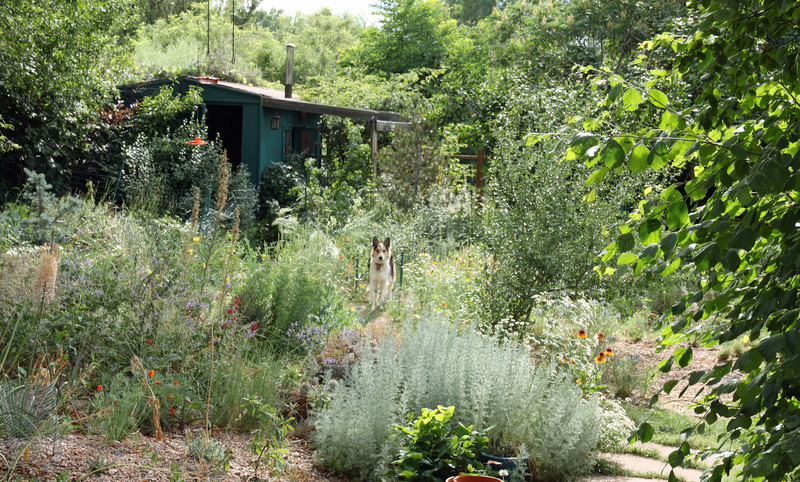 I love all the flowers and your yard is very lush and beautiful but my eye always goes back to the full and fluffy artemisia. Looks even better with you in the picture! Hmm, just some brief research on Amazon indicates you can dissolve the candy in vodka to make the Finnish drink Salmiakki. TGYLW ever done that? Umm, no. There isn’t any vodka here. Or licorice right now. It never lasts long. 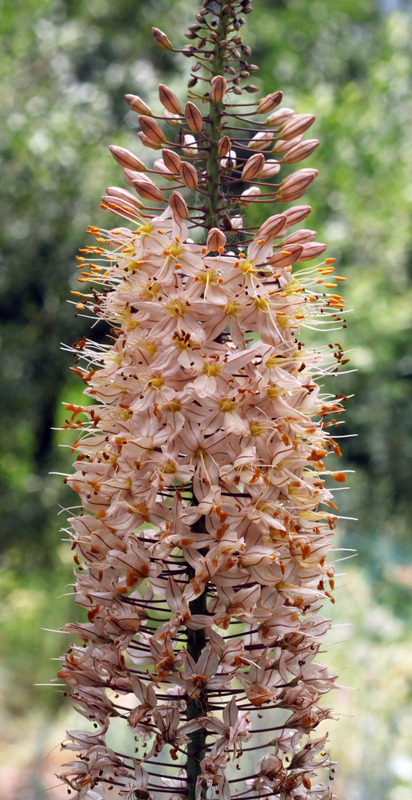 Wow, that Eremurus photo is the best I have ever seen (photographic quality and really cool plant). I so agree about fireworks being annoying. Thanks. As maybe you know, there would have been more eremuruses but I had to try them. Not really eat them, but dig them up and run around the back yard with them, with the guy I live with shouting something about “Fourteen euros apiece!”, which made absolutely no sense at all to me. I dug up some other eremuruses too; ones he got from a regular bulb broker like you find online. That was when I was super little, of course. The fireworks are really annoying, and illegal here, too, though that doesn’t stop some people. The guy I live with said that one time, many years ago, a fire was started in the back yard because of fireworks. Good thing the hose was hooked up at the time.